Acura says “the critical mission of ILX is to bring new buyers into the brand.” But other than the mid-sized TLX, fact is Acura doesn’t sell many traditional cars. However, the 2019 updates applied to the compact ILX should reinvigorate its sales. 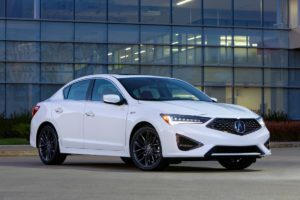 According to Acura, its combination of sportier styling, new technology and an aggressive reduction in price will strengthen its positon as their gateway sedan in terms of attracting millennial buyers. The Diamond Pentagon grille highlights an all-new front and rear design, the refreshed dual-screen offers more intuitive menus, faster processing and Apple CarPlay and Android Auto compatibility, the reshaped sport seats are more intricately styled and the latest generation A-Spec treatment gives the raciest ILX model a more distinguished appearance. The Red leather seats with black suede inserts are just one example of this. Other new items for the 2019 ILX include Acura’s Jewel Eye LED headlights, 5 new exterior colors, LED taillights, power lumbar control for the driver’s seat, and the AcuraWatch suite of active safety features is now standard. All models are still powered by a 201-horsepower 2.4-liter engine mated to an 8-speed dual clutch transmission with paddle shifters. Gas mileage checks in at 24mpg city/34mpg highway on premium. For the chassis, Amplitude Reactive Dampers are like having 2 suspension systems in 1 by providing a Ride Zone and a Handling Zone, affording the ILX a fun-to-drive, yet composed nature. A price drop of $2,200 gives the ILX a new starting price of $26,895 including destination available with Premium and Technology Packages. And then there’s the A-Spec with a starting MSRP of $30,645.